Date: Oct 13 2018, 2 p.m. - 8 p.m. 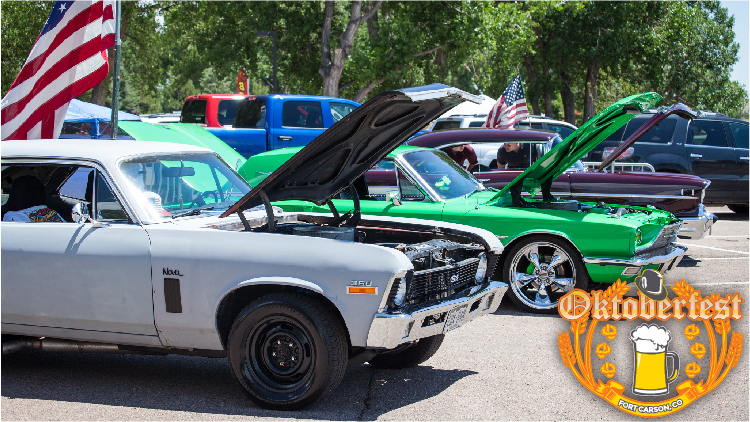 Car show is held at the festival venue: William "Bill" Reed Special Events Center. Open to all sorts of vehicles. Bring your friends and family to celebrate Oktoberfest and check out classics, hot rods, sports cars, low riders, motorcycles and more! Early Bird Online Registration: $25 per vehicle to enter into competition. Entry fee includes T-Shirt (available while supplies last), goodie bag, & entrance into the trophy competition. Trophy Presentation will be at 4:30 pm on 13 Ocotober 2018 at the event site. All vehicles entering into the competition can start arriving at 0800 and will need to be on site by 1200 no exceptions!!! Same-Day Registration:$30 cash only per vehicle. Shirts are not guaranteed on same-day registration. Gate access security procedures apply for the general public. Check out the FAQs and Terms & Conditions to learn more about entering Fort Carson.